It’s almost a shame to hide these great-looking Puma Sneaker Socks, but that’s just what the below ankle height socks are intended for. The socks come in a pack of three pairs, with three different shades all featuring a curving design, with the Puma logo to the heel and the Puma cat to the toe. 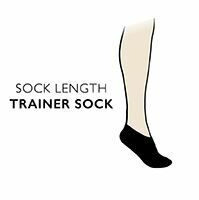 The low elasticated opening and hand linked toes for smooth seams makes these cushioned socks perfect for wearing with sneakers, plimsolls or trainers.